HONOLULU (14 Oct. 2016) The Western Pacific Regional Fishery Management Council yesterday in Honolulu recommended that the US Participating Territory longline-caught bigeye tuna limits remain at 2,000 metric tons (mt) per Territory for 2017. Pending approval by the Secretary of Commerce, the Territories of American Samoa, Guam and the Commonwealth of the Northern Marina Islands (CNMI) are authorized to allocate up to 1,000 mt of their limit to US fishermen through specified fishing agreements as authorized under Amendment 7 of the Pelagic Fishery Ecosystem Plan for the Western Pacific Region. The amendment, which has been in place since 2014, requires that the Territory longline-caught bigeye tuna limits be reviewed and recommended on an annual basis. Transference of a portion of their quota provides the Territories with funding for fisheries development projects in their respective Marine Conservation Plans. These plans are developed by the respective Governors, in consultation with the Council and approved by the Commerce Secretary. “The transfers also help to stabilize Hawai’i’s local fresh tuna market,”said Council Executive Director Kitty M. Simonds. Bigeye tuna weights and catch-per-unit-effort numbers resulting in recent earlier reaching of US longline-caught bigeye quota by the Hawai’i fishery. Source: NMFS Pacific Islands Fisheries Science Center. Hawai’i longline vessels are subject to US longline-caught bigeye tuna quota, based on Hawai’i’s 2004 catch and incrementally decreased per the conservation and management measures developed by the Western and Central Pacific Fisheries Commission (WCPFC), of which the United States is a member. In recent years, Hawai’i has reached the US quota progressively earlier in the year. NOAA analysis presented yesterday indicates that this is due to increased size and higher catch rates of bigeye tuna in the fishery. The WCPFC will meet in December to consider tropical tuna measures for 2017 and beyond. The Council yesterday voted to recommend that the National Marine Fisheries Service (NMFS) continue to develop a draft proposal to present at the WCPFC that would include spatial longline bigeye catch limits, which take into account sub-regional exploitation rates. The Hawai’i longline fishery operates principally in sub-region 2, which has among the lowest bigeye exploitation rates in the Western and Central Pacific Ocean. 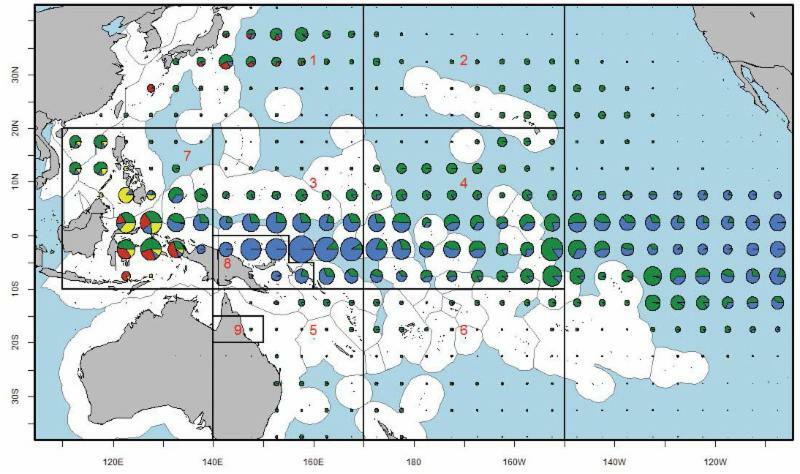 Distribution of bigeye catch (2003-2012) by method (longline green, purse-seine blue, pole-and-line red and other yellow) and sub-regions (boxes) used in bigeye stock assessments. Foreign crew issues in the Hawai’i longline fishery: The Council encouraged NMFS to request that the law and/or policy that prohibits foreign fishing crew from flying into Hawai’i be reviewed. Allowing foreign crew to fly into Honolulu could facilitate monitoring and documentation by the Department of Homeland Security and eliminate impacts to Hawai’i longline vessels from picking up contracted foreign crew in distant ports. American Samoa fisheries: NMFS reported that the American Samoa fisheries and canneries were impacted by closure of the American Samoa based purse-seine fishery due to implementation of the WCPFC-developed Effort Limit Area for Purse Seine (ELAPS). The Council recommended that NMFS continue to develop rulemaking to address disproportionate impacts to the economy of American Samoa from high seas effort limits applicable to US purse seine vessels. It also recommended that a study be undertaken on the impacts of the ELAPS closure on the American Samoa economy as a whole. The Council meeting continues today at the Laniakea YWCA, Fuller Hall, 1040 Richards St., Honolulu. For more information and complete agenda, go to www.wpcouncil.org, email info@wpcouncil.org or phone (808) 522-8220.